THE defining characteristic of technology is change – and in the current environment, change is disrupting traditional business models. But, amidst all of this disruptive change, there are some information management constants that do stay the same over time - the need to ingest, process and optimize business information. This need remains the same, but HOW organizations achieve this result of automating both information and processes is changing dramatically. Why are these particularly challenging times for information management? How do these changes impact demands upon information capture? What is intelligent capture, and how is it different from traditional document capture? What kinds of benefits can organizations realize by making intelligent capture a strategic priority? 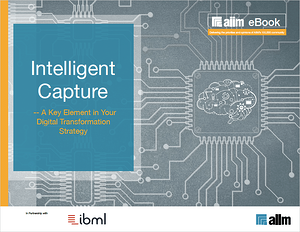 Get your free copy today and learn how Intelligent Capture is a key element of your digital transformation strategy.